Gov. 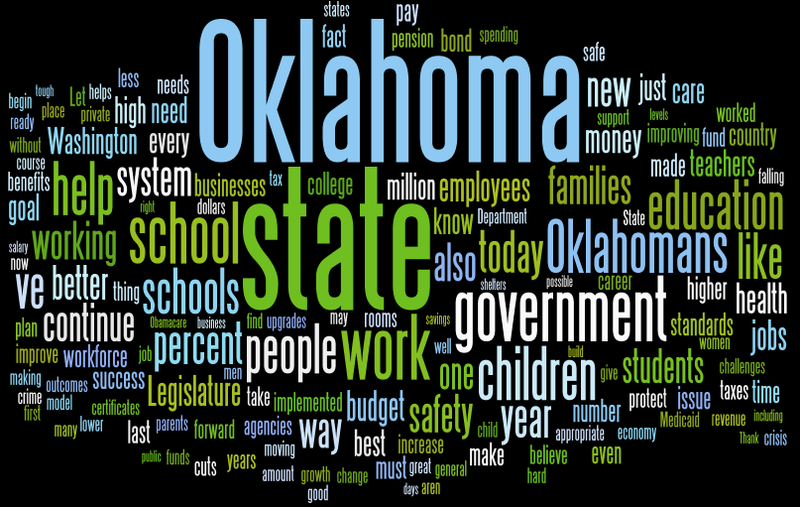 Mary Fallin’s “State of the State” speech on Monday, as released in written form, is represented below in a word cloud, which sizes key words according to how often they appear. Word clouds aren’t perfect analyses, but they can point to dominant themes and priorities, as well as to what’s missing. What are your takeaways? A few observations from us are below, based on the Wordle cloud and a search of the full text of the speech, which also is below. * School and education were big topics. * “Government” was a recurring word, often in a neutral reference. A few negatives. * Work” and “Working” were popular, used often to credit people or Fallin’s administration. One shout-out to teachers. * “Tax” or its derivative was uttered three times, twice in a negative context. * “Prison” and “corrections” were each mentioned once. Let me begin by thanking you for the honor of serving as your governor and delivering this address. The elected officials here today have a solemn duty to represent the people – their constituents – and to work to make this state a better place to live, work and raise a family. I know all of us – Republicans and Democrats – take that responsibility seriously. Thank you for your work and your dedication to this state. Because of the actions taken by this Legislature and, of course, because of our hardworking, innovative and resilient people, the State of this State is strong. Everyone here today should be proud of what we have accomplished. Together, we have overcome adversity. In 2011, the American Dream in Oklahoma was threatened. Middle-class families and small businesses were hit hard by the national recession. And it seemed possible – even likely – that we would leave our children a less prosperous state than the one we inherited. Our unemployment rate stood at 7.2 percent, leaving tens of thousands of Oklahomans without work. The state faced a budget shortfall of over $500 million. And just like the bank accounts of many Oklahoma families, our state savings had dried up. In fact, the state of Oklahoma was broke. Our Rainy Day Fund had $2.03 in it. This Legislature acted quickly and decisively, passing a series of measures to help jumpstart the economy, help working families and realign spending with fiscal realities. We balanced the budget the old fashioned way: by prioritizing and, when necessary, making tough cuts – just like those being made by Oklahoma families. We eliminated the red tape and bureaucracy choking small businesses. We improved government services and eliminated waste. We retooled our state agencies – consolidating duplicative boards and commissions. We made government run more like a business – efficient, effective and customer friendly. We passed comprehensive legal reform, minimizing frivolous lawsuits and creating an atmosphere more conducive to job growth and retention. We were finally able to overhaul our workers’ compensation system, moving from a contentious legal process to a more efficient administrative structure, a goal we had worked towards for the last decade. We focused on education and workforce training – making sure Oklahoma schools have the high standards they need to produce students who are college, career and citizen ready. We’ve also shown compassion and care for those who have served our country and those who have faced unique challenges. We’ve offered a hand up, not a handout. We have worked with the Legislature to increase oversight of our Department of Veterans Affairs, and tasked our new board with investigating and eliminating instances of abuse and neglect at our states’ veterans facilities. At the Department of Human Services, we’ve implemented the Pinnacle Plan, a comprehensive strategy to better protect and serve children in state custody, and place them with loving foster families. And we’ve offered increased resources for programs assisting those suffering from mental health issues, including drug abuse and addiction – helping people get the treatment they need to rejoin their families and communities as productive, happy members of society. For non-violent offenders in our prison population, we are working hard to offer treatment and rehabilitation – to be as “smart on crime” as we are “tough on crime.” I’m looking forward to a renewed partnership between the Department of Corrections, the Legislature and my office, as we work with the agency and its new director to evaluate and improve our smart on crime initiatives, including the Justice Reinvestment Initiative. All of these actions, along with the priorities I will outline today, are aimed at improving quality of life, creating jobs and building a more prosperous state. We know we’re on the right track, because the policies we’ve implemented over the last three years are working. Oklahomans are getting back to work and earning more. That 7.2 percent unemployment rate is now down to 5.4 percent. Oklahoma families have seen their incomes rise by over 6.3 percent since January 201l. That’s 44 percent higher than the national average and second only to North Dakota. By the way, I’m not ready to concede bragging rights to North Dakota, because they wouldn’t be number one without Oklahoma companies like Continental Resources leading an energy revolution with their work in the Bakken Shale. Our fiscal house is once again in order. Our Rainy Day savings account has grown from pocket change to over $570 million. It stands today at $530 million, only because this Legislature acted – wisely and compassionately – to appropriate funds for tornado recovery and reconstruction after last year’s storms. With over a half billion dollars remaining in that account, Oklahoma has a real safety net should we face another natural disaster or economic crisis. We are now a top ten state for net migration gains, meaning people, businesses and jobs from across the country are moving to Oklahoma. Together we have achieved great successes in the face of considerable challenges. I’m proud of the way Oklahomans have responded to unexpected challenges, sometimes even hardships. Of course, we have seen our share in the last year. There was no greater challenge or hardship than the one we experienced last May, when a series of tornadoes swept across central Oklahoma. The loss of life – especially the loss of children – was devastating. I will never forget the unbearable grief I saw when I met with mothers and fathers who had lost a child, or the scream of a woman who had just learned her husband had been killed. But I will also never forget the brave and compassionate actions of so many of our citizens: men and women taking complete strangers into their homes and offering them a place to sleep and a warm meal; Oklahomans, and even people from neighboring states, dropping everything to volunteer their time and resources to help the recovery effort. I remember walking through the rubble of Plaza Towers Elementary School as first responders worked desperately through the night, risking their own safety to clear rubble and cut through concrete in the hopes of uncovering even one more survivor. Some of those first responders are here, and I want to recognize them for their work, their bravery and their service to the state. Please join me in applauding them for their work, and applauding all the first responders and volunteers who helped us last May and continue to help us in times of crisis. Because of the efforts of men and women like these, today we are rebuilding and well on our way to recovery. Communities like Moore, El Reno and Bethel Acres are open for business again. Main Streets across central Oklahoma struck by tornadoes are once again thriving. We owe that success to our resilient, hardworking people. They are, as we say, Oklahoma Strong. Our schools are also being made safer and stronger. The Briarwood and Plaza Towers elementary schools are being rebuilt – with safe rooms. Our challenge moving forward is to improve safety in all of our schools. That process must begin by identifying our current needs. To help with that, the Department of Emergency Management is conducting voluntary safety assessments for districts that request them – helping evaluate the safety of our schools and offering recommendations for possible safety upgrades. Next, we need to act to ensure that our schools have the means to pay for these upgrades. Last week I announced my support for House Joint Resolution 1092, authored by Representatives Mark McBride and Jon Echols. House Joint Resolution 1092 is a Constitutional Amendment allowing every school district to pursue a one-time increase in bonding capacity to fund upgrades like storm shelters, safe rooms, and protections against dangerous intruders. Oklahoma has approximately 1800 schools, each built differently, each with its own unique needs. This measure preserves local control, allowing each school district and community to make their own decisions about how to address those needs. Some schools will wish to build safe rooms while others will retrofit existing structures to withstand tornadoes. Schools that already have safe rooms or storm shelters may choose to focus on security precautions to protect their children from intruders. This is a responsible plan for improving safety and security at our schools. We aren’t forcing new taxes on Oklahoma families or businesses. We aren’t passing new mandates. Most importantly, we are making our schools safer. I applaud the citizens and legislators who have engaged on this issue, exploring policies to help protect our children by improving school safety. I believe our plan offers the best, most realistic way to fund storm shelters and other safety and security upgrades. Others may disagree, but we should all remember that we share a common goal: to better protect our children and educators, and to save lives. Not only do we want our schools to be safe, we also want them to provide each child in Oklahoma with a world-class education. In fact, improving the quality and outcomes in education is the single most important thing we can do to attract and retain jobs, alleviate poverty, and help Oklahomans have fulfilling and productive lives. Here’s a fact: the best indicator of personal income is educational attainment. Similarly, the best predictor of social problems like drug use, teen pregnancy and crime is educational attainment. For many, education is the best and only path out of poverty. Our job as a state is to empower our students, parents and teachers by setting the bar high and challenging each other to succeed. I believe that every child can learn. Today in Oklahoma, only one-third of all jobs are available to those with just an academic high school diploma or less. And the majority of those jobs pay less than $25,000 a year. The “new minimum” for success is education beyond high school. Many Oklahomans are falling short of this new minimum. That’s not just a problem; it’s a crisis. To those who say that system is unfair or can’t work, I say look at U.S. Grant High School here in Oklahoma City. This is an urban, inner-city school. It faces all the challenges that we associate with a school in that category, both here and throughout the country. Four years ago, it would have been an “F” school. It was failing our children, and it was producing outcomes that were embarrassing for the students, parents and faculty. They decided enough is enough. They made changes. They engaged parents and students; revamped their teaching models; and reset expectations. And today this is a B+ school and my bet is it will soon be an A school. Today we have U.S. Grant High School Principal Clay Vinyard here with some of his students and teachers. Thank you all for the great work you are doing in school. Let’s give them a round of applause! And while we’re at it, let’s give every student working hard to better themselves, and every teacher and administrator in this state who are working to help give our children a better future a round of applause as well! To support teachers and students like these, we’re also working on increasing rigor in classrooms and raising the standards to levels required by college and the workplace. To continue to inspire innovation at the local level, CareerTech is introducing a performance-based funding strategy to increase the number of Oklahomans earning certificates and gaining wealth-building jobs. We’ve already begun to see more Oklahomans earn college degrees or career technology certificates, thanks in large part to a program we have implemented called Complete College America. When I launched Complete College America with the Oklahoma higher education and CareerTech communities two years ago, we set of goal of increasing the number of career certificates and degrees awarded by 1,700 per year. We didn’t just meet that goal, we vastly exceeded it, awarding over 2,900 degrees and certificates in the first year of implementation. That’s 2,900 more men and women now on a path to pursue their dreams and enter the workforce as teachers, engineers, civil servants or entrepreneurs. Our goal is to continue to build that momentum for greater educational achievement in Oklahoma. Now, as you know, our general revenue fund is lower this year than was estimated. We are on a tight budget, as we should be. But good education requires appropriate funding. That’s why I am proposing a $50 million increase to help students at our K-12 schools. I have, however, proposed targeted cuts to most agencies. These cuts are necessary. For decades, policymakers have skimmed off the top of our general revenue fund, apportioning money to programs supporting education, road-and-bridge construction, and other priorities. Over time, that’s reduced the general revenue fund and left us with less money to appropriate. The dip in general revenue also reflects the uncertainty coming from Washington: sequestration, the government shutdown, and the tax increases and financial chaos created by Obamacare. So for all these reasons, my budget proposes targeted spending cuts and asks our agencies to continue to find ways to operate more efficiently and effectively and to cut waste. In the coming days and weeks, we know what we’ll hear. Those who like bigger government and higher taxes will say the sky is falling. Entrenched interest groups and even some agency heads may say the same thing. But guess what? It’s not. The cuts we’ve proposed this year amount to five percent or less of agency budgets, and in total amount to about one percent of state spending. Any business worth its salt can find five percent costs savings without crippling the services it provides. Families have to make the same choices all the time. When I was a single mother, I had to take care of my children while cutting a whole lot more than 5 percent from my family budget. I know most Oklahomans have had to make the same kind of tough budgeting choices at times, and we manage. On average, state government has a combined $830 million every year in accounts called “revolving funds.” Many agencies can support critical programs and operation by tapping into these funds. State government must be more transparent and accountable in its budgeting, and shedding light on revolving funds will help to achieve that goal. Of course, ultimately what makes state government work is our people. My mother was a social worker with DHS and my father worked with the unemployed at the Oklahoma Employment Security Commission. State government needs to be able to attract and retain hardworking, dedicated Oklahomans like them. And to do that, it needs to compensate its employees fairly. Last year we commissioned a state employee salary and benefits study. The study showed the total salary and benefits package we give to the average state employee is roughly equivalent to those given out in other states. We spend the same amount of money per employee. But the way we spend that money is lopsided. Many employees working for the state of Oklahoma have salaries far below both the private sector and other states; meanwhile their health care and other benefits are far more generous. That may have been a good pay model to attract qualified workers in the 1970s, but it is not today. First, we should begin offering targeted salary increases to some state employees paid below market value. I have included money to do so within my budget. Second, we should reform our current pay system to one that rewards performance over time-served. Doing so will encourage better productivity and services. And finally, new hires within the Oklahoma Public Employees Retirement System should be moved from an outdated, mid-20th century pension system and to the more portable and flexible 401k-style benefits used in the private sector. Businesses made this change a long time ago, recognizing that the old pension model didn’t appeal to a more mobile workforce in today’s modern economy. It’s time for state government to stop playing catch-up. Moving to a defined contribution model helps us to modernize and accomplishes two important goals. First, it allows flexibility for future public employees to take the money they have accrued with them if they change careers. That helps us to make state employment more attractive and aids in recruitment. Second, it stabilizes the system for current public employees and retirees. Oklahoma pension systems currently have $11 billion in unfunded liabilities. The system as it stands today is not financially sound or sustainable. It’s important we shore up our pension systems so we can pay out the benefits we have promised to our retirees. Just as it’s our responsibility to help maintain a motivated and skilled workforce in state government, it’s also our responsibility to maintain and preserve state buildings and assets. In the case of the state Capitol, we are failing in that goal. We must begin repairing the People’s House now. The best, most realistic way to accomplish this is through a bond issue. A bond issue could not come at a better time. Interest rates are low. Most importantly, 41 percent of the state’s bond indebtedness will come off the books in 2018, and over 86 percent will be eliminated in the next 13 years. July of this year will represent the 100-year anniversary of the groundbreaking of this building. Let’s make sure we can celebrate that historic landmark knowing that we have taken action to improve its condition, not sit idly by while it crumbles and falls apart. Passing a bond issue is the right thing to do. I have put money towards bond issue payments in my executive budget, and I’m asking the Legislature to pass a bond issue and send it to my desk as soon as possible. The things I’ve addressed today – protecting our children, improving education, adequately compensating state employees, modernizing our pension system and maintaining the state Capitol – all fall under the category of smart, responsible government. If we do these things, Oklahoma can offer a contrast to the government Americans everywhere are so disillusioned with: the kind we see in Washington. Washington is leading this country in the wrong direction, but Oklahoma isn’t about to follow. In fact, we can offer a model to the rest of this country of what sound, common sense, conservative governance looks like. That starts with categorically and unequivocally rejecting Obamacare and the drastic expansion of government-funded and government-run health care within it. Rejecting Obamacare does not mean we are uninterested in the health of Oklahomans. We have worked hard to improve health outcomes and will continue to do so. For instance, I am continuing to push for a waiver making Insure Oklahoma a permanent program. Insure Oklahoma helps 20,000 low-income, working Oklahomans purchase health insurance. Yet the federal government is constantly threatening to end the program, despite its proven success. That must stop. I’m also committed to working with this Legislature to pursue Medicaid reform. There are a lot of great, innovative ideas and policy solutions coming from the men and women in this room, and we will continue to explore them. I’m looking forward to continuing our work with private insurers, our healthcare industry and businesses to transform our “sick care system” – one that only helps people after they’ve fallen ill – into one that truly improves health outcomes by emphasizing preventative care and healthy living. We also need to continue to encourage access to appropriate levels of care. Far too many people with non-critical health problems are receiving expensive, unnecessary treatment in emergency rooms. Expanding Medicaid, as President Obama has proposed, does not solve this problem. In fact, it makes it worse. The cost of Medicaid growth and expansion is astronomical: an estimated $850 million for the state of Oklahoma over a number of years, and over $1.3 trillion for the nation. The president’s plan is unworkable and unaffordable. We cannot plunge this nation further into debt, or place Oklahoma on a fiscally unsound path, by expanding Medicaid. Both the president’s plan and alternative proposals that rely on federal dollars in the Affordable Care Act amount to the same thing: a dramatic growth in unsustainable government spending. Washington wants to lead this nation in the wrong direction – but Oklahomans will not be led astray. We will find our own way forward, a better way. That goes for tax policy as well. Washington has taken every opportunity to raise our taxes. We should take every opportunity to lower them. I believe responsibly lowering the income tax is the right thing to do. This is the people’s money; it should stay with the people. It is the people and the private sector, not state government, that are the true engines of job creation. When we lower taxes we allow them to invest in their businesses, spend dollars in the economy, and help to create Oklahoma jobs. So this legislative session I have included in my budget an additional quarter-point income tax reduction that will return over $100 million to the state economy once fully realized. Let’s take this opportunity to show our country that lower taxes and limited government do work. We believe in them for a reason. The Oklahoma Way – not the Washington Way – is the best way to support economic growth and help middle class Americans. What I have outlined today is my plan to build upon this state’s momentum: to help Oklahoma families find good jobs that pay well; to protect our children and provide them with the necessary tools for success in life and in the work force; to responsibly manage taxpayer dollars; and to demonstrate that responsible, productive government does exist, even if Washington is doing its best to prove otherwise. In Oklahoma, we have a long history of working together to solve problems. A long history of resilience, generosity, compassion and, ultimately, success. Let’s work together to write the next chapter in that Oklahoma history, and ensure we are leaving our children with a state that is better, stronger and more prosperous than the one we inherited. Thank you for your dedication to the state and for giving me the honor of serving as your governor.